Your child's baptism is a memorable event which you want to preserve and remember for generations to come. 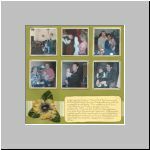 Making a baptism scrapbook layouts you will have to use photos and journaling to preserve this special day. You can get more ideas from the scrapbook layouts you will find below.